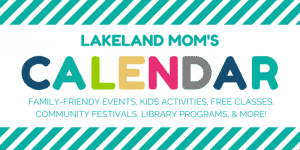 Lakeland Mom’s Local Event Calendar is a compilation of all of the family-friendly events the Lakeland area has to offer! We guarantee you won’t find a more comprehensive list of events for kids and families anywhere else in town. Are you interested in having your event featured on this page and promoted by Lakeland Mom? Get more info here. Do you know of a family friendly event that isn’t listed on our calendar? Submit it below. The LakelandMom.com Event Calendar is provided as a community service to local citizens and organizations. While we work hard to keep our calendar updated, we encourage you to check directly with original sources via the links provided. Events are occasionally canceled, edited, rescheduled, or postponed for a variety of reasons, and we are not always made aware of these changes. We cannot guarantee the accuracy, timeliness or quality of the content of every source listed here.